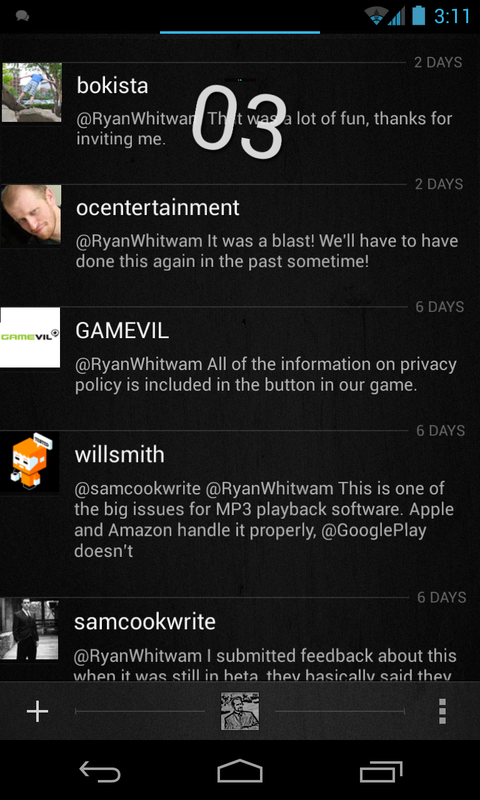 Twitter apps on Android have gotten very mature in the last few years. You can't just throw out any old thing and expect people to use it – you've got to have the big features. Carbon has some of those features. 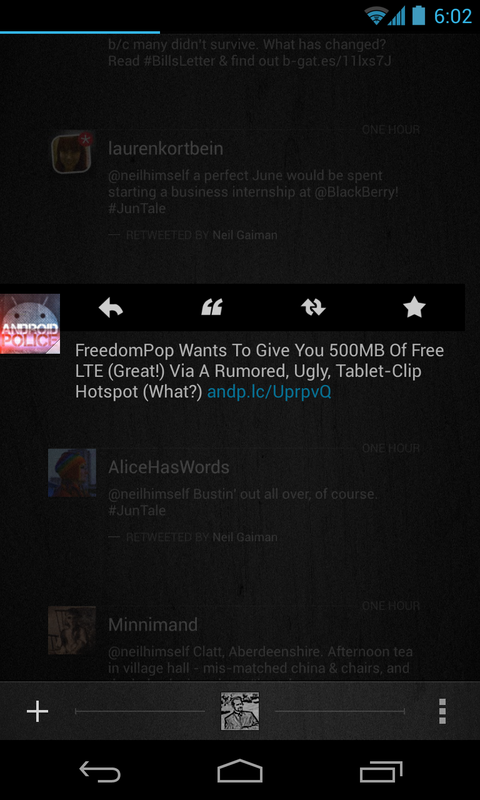 One of the first things I look for in a Twitter client is how it handles in-line images and links. Carbon does a good job of loading images in the stream; tapping on them brings up a full preview that you can zoom in on. Links are a different matter, as there is no built-in browser. If you open a link, you will be dumped out to your main browser. 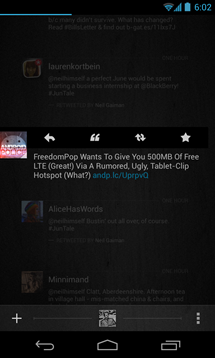 Compare this with Falcon Pro, which has a killer Instapaper-infused browser, and Carbon is already behind the times. As for notifications, there's both good and bad. I've found the notifications for tweets and direct messages to be very reliable. However, you can't change the frequency of refreshes. It's 15 minutes or nothing. This is a pull update – not push. I can't so much fault Carbon for this seeing as most other clients (like Falcon Pro) don't even utilize push updates. What I'm a little less forgiving of is that the refresh is only pulling the notification. When you open the app, you still have to manually refresh it every single time. 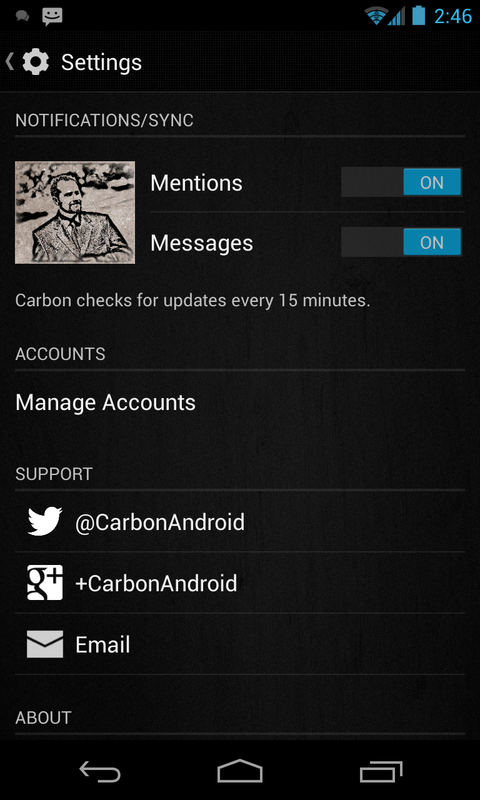 In this initial release, Carbon has no widget. I'm pretty bummed about that, honestly. 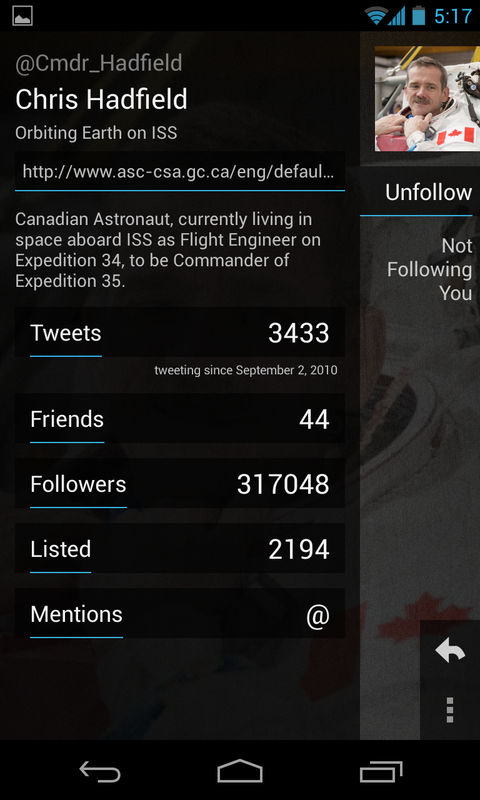 I suppose you can use the Falcon widget, but that's not ideal because Carbon doesn't register itself as a handler of Twitter links. Thus, the app shortcut on Falcon doesn't work. In general, there are a lot of settings missing from Carbon. The app does photo uploads and URL shortening automatically, but you can't control what service it uses. This isn't a huge deal, but something to consider. Some other things I'm missing from the settings include custom notification sounds, mutes, and the option to display real names in the stream. Oh, and no tablet support. 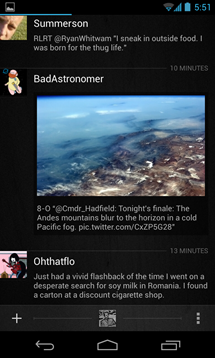 For reference, Falcon Pro has almost all of this. The one feature I know a lot of folks will be ecstatic over is multiple account support. Most devs are shying away from supporting more than one account so as to not use up their limited supply of Twitter auth tokens. Carbon's got you covered, though. I feel like Carbon could have looked great. It has the makings of something slick and smart, but the longer I use it the more I think the design falls flat. 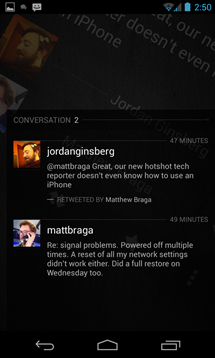 The ideas here aren't bad – the UI is based around your three columns (timeline, mentions, and DMs) as floating panels. You can swipe back and forth, and the app mimics the Android home screen tilting effect when you get the the left or right edge. This is nice and subtle. Carbon does the pull-down refresh trick, but that's where things go wrong. The entire panel tilts way off axis and a little 'refresh' tile flips around at the top of the screen. As if that wasn't enough, the number of new tweets spins around at the top after the refresh has finished. All these animations are incredibly distracting and unnecessary. Loading up a user profile is... weird. 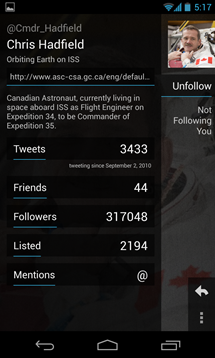 It's split into two columns with the bio, name, and stats in the large left panel. 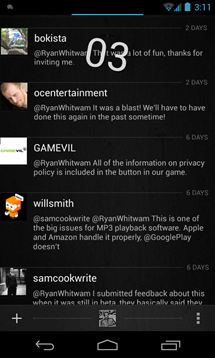 Then the tiny sliver of a right panel has the avatar, following status, and some buttons. Frankly, this UI isn't working. It looks broken – like something failed to render properly. I will say this for Carbon: the scrolling is very smooth. 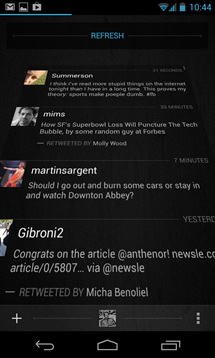 Falcon Pro is famous for buttery smooth scrolling, and Carbon is right up there. 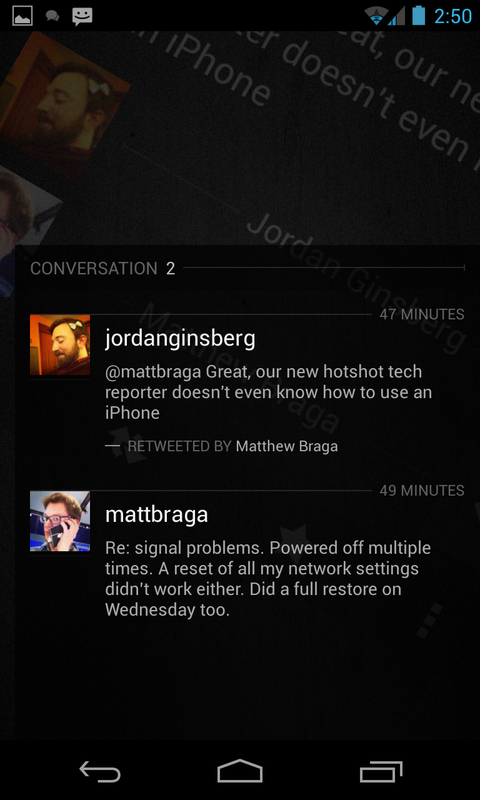 You can long-press on a tweet to get options for retweeting, replying, and so on. 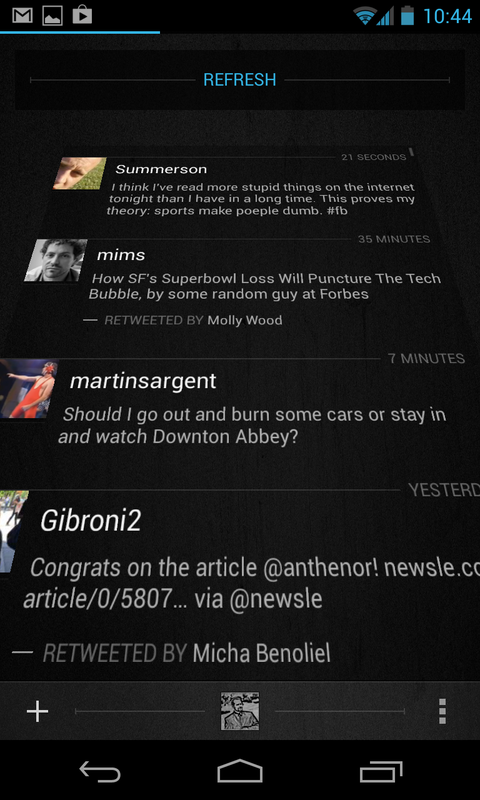 This interface pulls the tweet forward just a little and dims everything else. I actually like this very much. It's understated and elegant. Something I'm not so fond of is the way Carbon pulls up conversations. Like other clients, Carbon lists replies below a selected tweet. However, things get weird when you drag up the replies. The selected tweet twists and stays at a bizarre 45-degree angle as the replies are overlaid on it. It looks awful. Through all of this I was not able to get over the wood grain background. Really? Wood grain? It just feels so out of place. Removing that would go a long way toward making the app look nicer. Carbon is just trying too hard to be flashy when it has all the pieces needed to be a good minimalist app. It's like Carbon is begging for attention. "ZOMG, look at me. Look at how smooth this animation is. Now look at this one, and this one. Hey, wood grain is cool, right?" I don't want to give you the impression that using Carbon will give you cancer (these statements not evaluated by a doctor). It works, but I don't think that it's particularly good at anything. The way it refreshes in the background is poor, it relies too heavily on flashy animations, and is missing some basic features. This doesn't feel like a final release. It's beta at best. Granted, Carbon is snappy and the basic UI conventions are good. 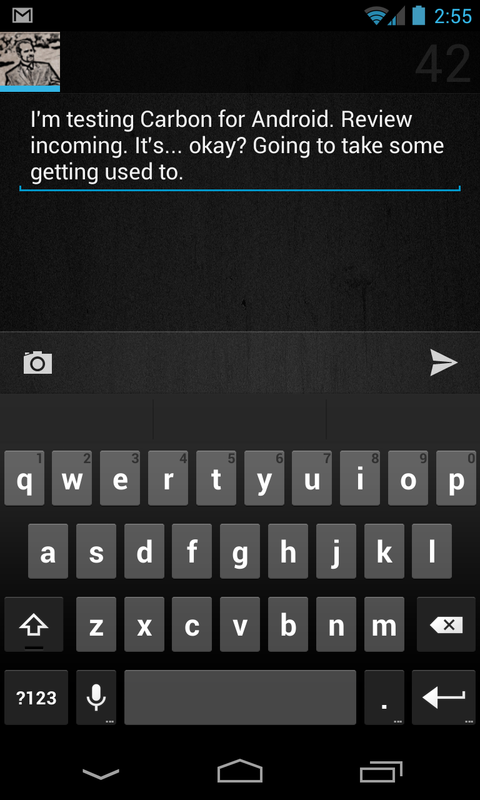 It has multiple account support, which is missing even from Falcon Pro. The only reason I can think of that you'd want to use it over something like Falcon Pro or Plume is that Carbon is free and has no ads. Still, Falcon Pro is just $0.99 and it's a much better experience. Carbon could be great someday with some work, but today is not that day.